A NEW travel business in Kilwinning is proving a winner with customers and with Irvine Bay Regeneration Company. 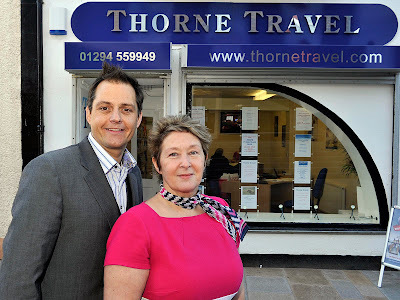 Thorne Travel, which opened earlier this month in the town’s Main Street, employs four people from North Ayrshire already. And as an opening promotion, the company ran a free draw competition with a luxurious one week cruise as the top prize – and invited James Ledgerwood, Irvine Bay Regeneration Company’s project manager for the Kilwinning Main Street project to make the draw. There are currently 646 Ayrshire business stories permanently archived on this site. To locate those of most interest to you, please use the site search facility in the top left hand corner of this page. Type your search term in the white box, then click the magnifying glass symbol.